If you are new to this blog, please begin here. Although we had met Park Jong Il some years before and even sponsored his visit to America we first met his family in their home in 2005. Their daughter had just been born and their home, studio and kiln sat alone nearly at the top of the mountain. 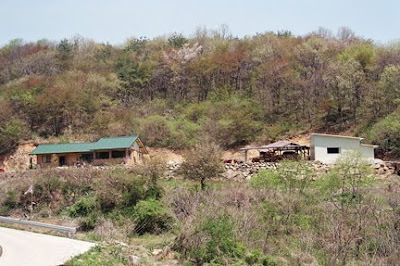 When I began writing about Park Jong Il, I simply thought that you might be interested in the addition of his tea gallery and how he built it. Then I remembered that he had some interesting ways he handled water for tea – particularly his tea tower. That led to posts on tea sets, tea cups and tea bowls and my most recent post on his kiln. These were not pre-conceived posts but just seemed to flow one into the other. Somewhere along this process it was obvious that I was presenting a rather full picture of a tea ware artist and what it takes to provide the hand formed tea ware we use everyday. Two things were missing: the forming process and his family. When we visit Park Jong Il he is busy presenting tea and is seldom creating work. He always greets us with a ready smile. This photo of him trimming the foot on one of his tea bowls is our single forming photo. 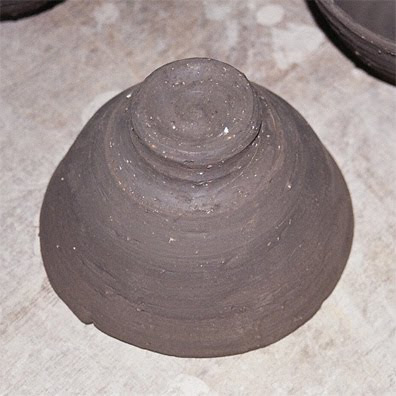 Trimming is as important to the forming process for most Korean ceramic works as ‘turning’ or ‘throwing’. To a chawan connoisseur each part of the bowl is very important - the line of the form, the depth of the bowl, the quality and color of the glaze, but perhaps none more so than the foot. The very best bowls can command great prices but in spite of the stories of simple tea bowls demanding great sums, clearly the motivation is not great wealth. 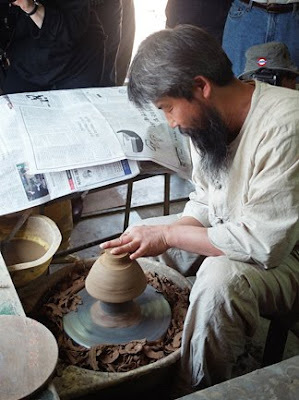 While that is possible for a few tea ware artists, it is not the case with the hundreds if not thousands of tea ware artists who live very simple lives just so we, who consume tea, can enjoy a cup of tea while holding one of their cups in our hand. Even those tea ware artists who have achieved considerable fame and financial fortune did not begin with a financial motivation. For the vast majority, the motivation to create tea ware is not wealth in monetary terms - but it may be wealth in more spiritual terms. There is something compelling and spiritual about the combination of the physical, psychological and philosophical aspects of ones being that must come together to create Tea ware. That combination inspires one to work, and dedicate ones life to it. More rare is he/she who has a companion who understands that motivation and with whom he/she can share that experience. 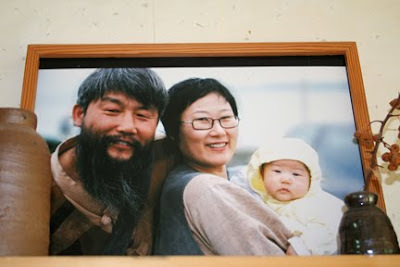 Park Jong Il has such a companion in his wife Shin In-suk*. 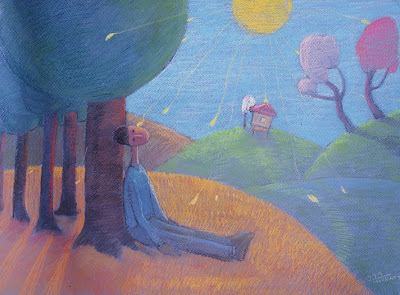 Shin In-suk is herself an artist with considerable talent. 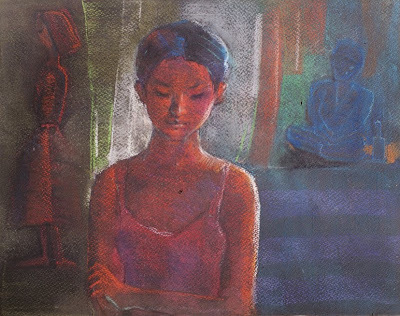 Her drawings, paintings and occasional sculpture sometimes whimsical, like many Korean artists before her, often capture poetic life moments. 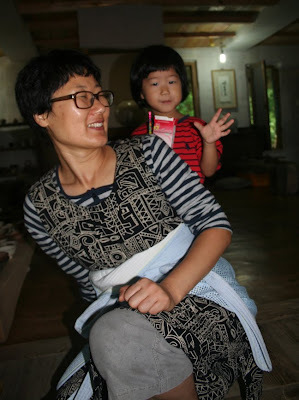 Shin In-suk designs and sews most of Jong Il’s clothing - as seen in the photos of Jong Il serving tea above. She is a superb chef*, a wonderful and loving mother and supports her husband in many other ways. 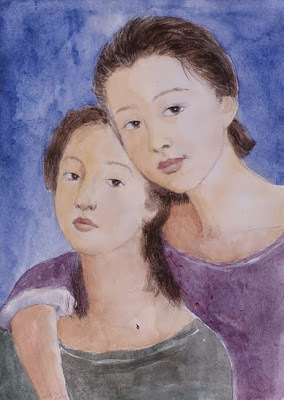 Their daughter Park Seo-Ryeon is growing in the footsteps of her parents showing early signs of considerable artistic skill. 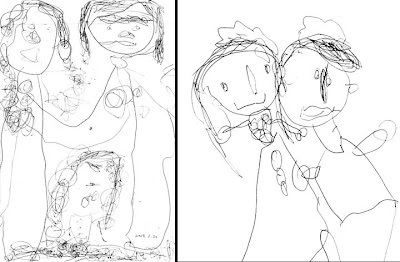 This is Seo-Ryeon's work at the Western ages of 3 and 5. It is obvious that the gift of artistic ability did not pass her. Presenting this tea ware artist and the family has been more than a pleasure. From the humble building of his tea gallery and home to his work, kiln and family we have been able to look a little closer than usual at what it takes to bring us a hand formed cup, bowl or tea pot for our daily tea. Contact us if you are interested in obtaining his work or would simply like to taste one of his favorite teas. One thing is becoming very clear to me. I need to get new images of Seo-Ryeon's work. She is growing up very fast. 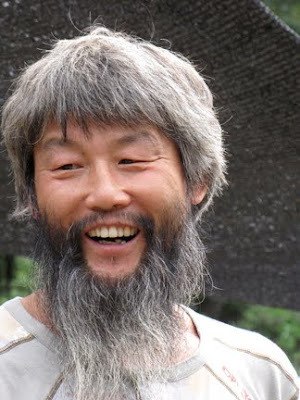 *Korean wives most often keep their family name. *Shin In-suk prepared a feast for our group during our visit in October 2009 that was the best meal we had during the tour. I am a Korean American potter and retired professor. I worked principally with Kenneth Beittel, Hamada Shoji, Manji Inouie and worked in Icheon, Korea. I’ve been a potter for many years and fire mostly in gas and wood. Occasionally, I fire anagama with Ken Shenstone. Mary, my wife joins me in this work. 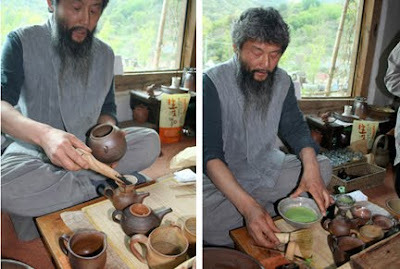 For nearly 40 years, I have also been interested in Korean tea, about 10 years ago I decided to try to promote Korean tea and Korean tea ware. That was when Morning Crane Tea was born. Why have I not mentioned the long interest in Korean tea here before. I consider myself to still be a beginner. At the same time, I know many others who consider themselves experts on Korean Tea having studied it a few months or a year or even after one trip to Korea to view their tea fields or a few conversations with several Korean tea people. If they are experts and I am not, why do I find so many errors in their work? In another ten years I may no longer say I am a beginner, but until then this is what you have.